"Farmer girl milking a cow". Provided by Julie Ruiz, UQTR. Editor’s Note: This is part of a series showing the work of the Sustainable Farm Systems project. When most of us think of Quebec agriculture, we think of dairy farming and a province that is the main supplier of dairy products to the rest of the country. Indeed, in 2016, Quebec is the main producer of dairy products in Canada, though in the last decades Ontario has almost reached the same number of milk cows and is producing similar amounts of milk. But dairy products are no longer the most important agricultural product in Quebec, either economically or measured in calorific value. The idealized picture of cattle grazing in large green meadows all around Quebec vanished a long time ago. Only in small parts of certain regions, such as Outaouais, might we find cattle grazing free and not confined in farm buildings and barns. Former pasture land within the farms has disappeared and been reallocated to more productive and intensive crops, such as corn or soybeans. These crops are in turn used to feed the pork industry, which has replaced dairy as the most important livestock sector since the 1980s. Behind this shift lies a socioecological transition in agriculture from a traditional regime to an industrial one. My research in Quebec analyzes the impacts of this transition, especially on the landscape, the environment, and associated ecological patterns. The theory and methodology employed and developed by the Sustainable Farm Systems project has provided me with the proper tools for these purposes. The goal of this long-term socioecological research is not only to study and clarify ecological patterns, but to identify and analyze their driving forces and societal pressures. Among these tools, the calculation and evaluation of energy balances of agroecosystems represents a very important way to assess their efficiency and sustainability. By measuring the flow of energy through the landscape, and interpreting the complex matrix of land uses and physical features of a given territory, we can also assess a farm’s ecological connectivity. This analysis, applied to different moments in time, provides us with a better understanding of the evolution of the ecological patterns of agroecosystems in the past. Figure 1. 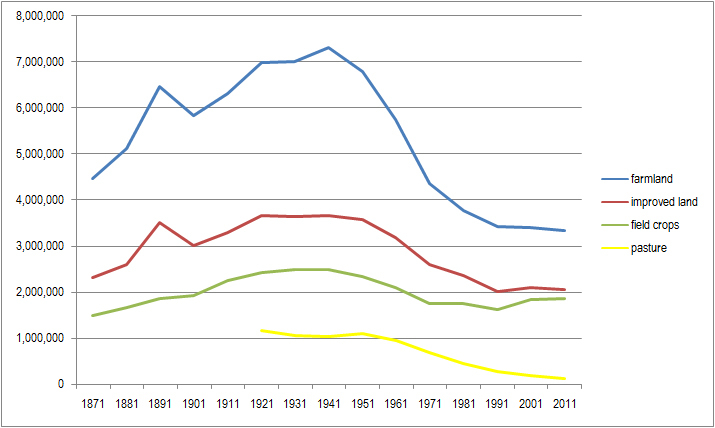 Evolution of farmland, improved land and cropland in Quebec (in hectares), 1871-2011. Since the mid-twentieth century, one of the most important changes in agriculture in all Western societies has been the process of farmland loss (Figure 1). Until the Second World War the only way of increasing agricultural production and productivity in North America was through a process of land colonization, clearance, and improvement. Quebec stands as a clear example. During that time of land colonization, a very extensive mixed farming was practiced in the province. The agrarian system combined crop production with the raising of livestock. In a traditional organic system, trade was very limited so most of the resources came from local territory. At the same time, fertilizers were restricted mainly to dung from cattle and a number of crops grown specifically to return nutrients to the soil. Figure 2: Hectares of main crops in Quebec, 1900-2011. Hence, a certain amount of land had to be dedicated to pasture, and some cropland to fodder crops for feeding livestock, which provided not only food but also services such as draught power. In Quebec, mixed farming reached its height in the 1940s. Until then, most cropland was dedicated to hay and oats, mainly to feed cattle that provided dairy products and horses and oxen that provided labor (Figure 2). During this period of organic agriculture, crop byproducts and residues had low market value, but were a key component for the household and environmental reproduction. Efficiency and sustainability decreased at the end of the first half of last century. Organic agriculture was highly intensified at this time, and some symptoms of ecological degradation started to emerge, such as soil depletion. Although farms still depended on the reinvestment of seeds, and crop residues for animal feed and bedding, external fossil fuel-based inputs began to replace organic production. In response, farmers increased land productivity through specialization in pork and poultry production. Inputs from outside the agroecosystem, such as chemical fertilizers and pesticides, machinery, and imported seeds invaded local markets and farms. However, this process of agrarian industrialization was slower in Quebec than in other Western regions, especially Europe. For instance, until 1966 farms in Quebec featured an average of less than one tractor per farm. Since this moment, though, there has been a total industrialization of agriculture with a clear prominence of agricultural inputs coming from external markets, consuming huge amounts of energy for production and transportation. As a result, agroecosystems became very inefficient from an energy point of view: they started consuming much more energy than they produced. Figure 3. Changes in concentration of farmland and land devoted to corn production in Quebec, 1951-2011. During this period of agricultural industrialization, farmers faced forces that threatened agricultural survival, such as urban sprawl and the progressive decline of agrarian incomes. Even agrarian intensification was sometimes insufficient to overcome these forces. The last option was the abandonment of agriculture. From the 1950s on, farmland has declined by more than 50% in the province. The surviving farms, mainly along the St. Lawrence River, passed from diversified mixed farming to large intensive farming systems based on monocultures of corn and soybeans. Pasture land disappeared and livestock were bred and raised in energy-intensive industrial feedlots. The more we move away from this area, the more dairy production, linked with more extensive cropping of oats, has remained (Figures 3 and 4). In 2011, cropland dedicated to corn and soybean production practically equaled that allocated to all hay and fodder (Figure 2). Figure 4. 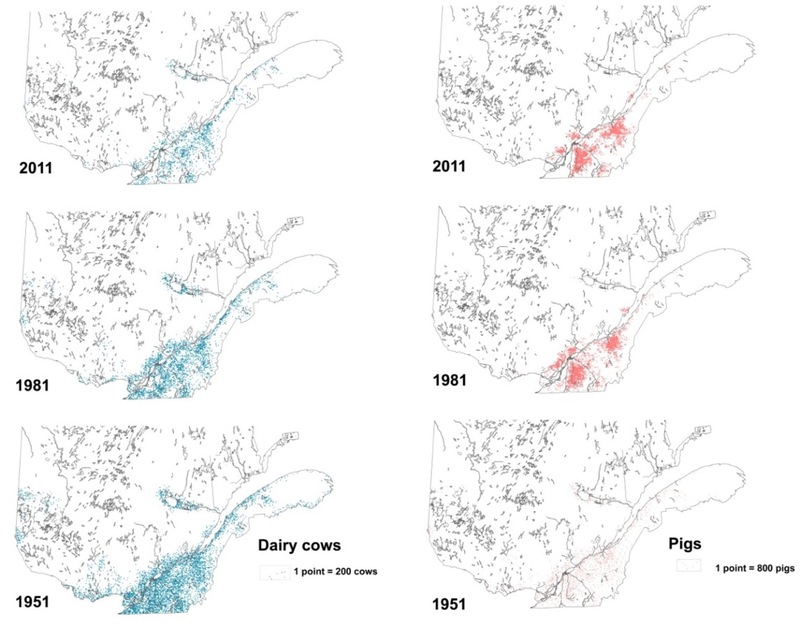 Changes in concentration of milk cows and pigs in Quebec, 1951-2011. In summary, this specialization in swine production, the result of a socioecological transition towards an industrial regime, is not efficient or sustainable, as it is the cause of serious landscape and environmental costs (i.e. landscape degradation, loss of biodiversity, or contamination of groundwater). Although agricultural productivity has increased greatly, the changes have resulted in the consumption of large amounts of energy, most of which is imported, contributing to global warming. Studies of traditional agroecosystems, however, can help our society in a transition towards a new more sustainable socioecological regime. Haberl, H., V. Winiwarter, K. Andersson, R.U. Ayres, C. Boone, A. Castillo, G. Cunfer, M. Fischer-Kowalski, W.R. Freudenburg, E. Furman, R. Kaufmann, F. Krausmann, E. Langthaler, H. Lotze-Campen, M. Mirtl, C.L. Redman, A. Reenberg, A. Wardell, B. Warr, and H. Zechmeister. 2006, “From LTER to LTSER: Conceptualizing the socioeconomic dimension of long-term socioecological research.” Ecology and Society11: 2-13. González de Molina, M., Toledo, V.M., 2014. The Social Metabolism. A Socio-Ecological Theory of Historical Change, Environmental History. Springer, New York; Marull, J., Pino, J., Tello, E., Cordobilla, M.J., 2010. Social metabolism, landscapechangeandland-useplanning in the Barcelona MetropolitanRegion. Land Use Policy 27, 497–510; Tello, E., Galán, E., Sacristán, V., Cunfer, G., Guzmán, G.I., González de Molina, M., Krausmann, F., Gingrich, S., Padró, R., Marco, I., Moreno-Delgado, D., 2016. Openingtheblack box of energythroughputs in farmsystems: A decompositionanalysisbetweentheenergyreturns to external inputs, internalbiomassreusesand total inputs consumed (the Vallès County, Catalonia, c.1860 and 1999). Ecological Economics 121, 160–174. Ecological connectivity is a measure of the capacity of one species to move across a heterogeneous landscape without being interrupted by artificial barriers. Statistics Canada, 1968: 1966 Census of Agriculture, Statistics Canada, Ottawa. Statistics Canada, 1953: Ninth Census of Agriculture. 1951, Statistics Canada, Ottawa ; Statistics Canada, 2012: 2011 Census of Agriculture. Available online at: http://www.statcan.gc.ca/eng/ca2011/index.